GenreOnline.net: Shout! Factory: New animated feature HOWARD LOVECRAFT AND THE FROZEN KINGDOM (Jane Curtin, Ron Perlman and Christopher Plummer) debuts 9/27 across home ent, VOD, Digital HD and Redbox.| Movie Trailer Released! Shout! Factory: New animated feature HOWARD LOVECRAFT AND THE FROZEN KINGDOM (Jane Curtin, Ron Perlman and Christopher Plummer) debuts 9/27 across home ent, VOD, Digital HD and Redbox.| Movie Trailer Released! H.P. Lovecraft, famed horror and fantasy writer, was once just Howard Lovecraft, a strange and lonely child. Howard was a boy of infinite imagination and boundless curiosity. His family however was not without peculiarities of their own... This fall, loyal fans and enthusiasts of Lovecraft’s literature are invited to venture into the imaginative Lovecraft universe through the new animated feature HOWARD LOVECRAFT AND THE FROZEN KINGDOM. Written, directed and produced by Arcana Studio’s Sean Patrick O’Reilly (Pixies),HOWARD LOVECRAFT AND THE FROZEN KINGDOM is the highly-anticipated movie adaption of Arcana’s popular graphic novel of the same name and features an all-star voice cast of Emmy®-winner Jane Curtin (3rd Rock from the Sun), Golden Globe®-winner Ron Perlman(Hellboy, Fantastic Beasts and Where to Find Them), Academy Awards®-winner Christopher Plummer(Beginners, Up), Doug Bradley(Hellraiser), Kiefer O’Reilly (DC’s Legends of Tomorrow) and Alison Wandzura (CW’s Van Helsing). A veritable love letter to Lovecraft himself, HOWARD LOVECRAFT AND THE FROZEN KINGDOM is a fantastical movie adventure that entwines new storytelling, actual events of H.P. Lovecraft’s life, iconic elements of his writings and literary characters Cthulhu, Shoggoth and more. On September 27, 2016, Shout! Factory in association with Arcana Studio present HOWARD LOVECRAFT AND THE FROZEN KINGDOM on two-disc Blu-ray™+ DVD combo pack (with digital copy), DVD (with digital copy), Digital HD, VOD and Redbox. The highly collectible Blu-ray™ combo pack and DVD set comes with bonus content, including audio commentary and featurette! HOWARD LOVECRAFT AND THE FROZEN KINGDOM is available for pre-order at ShoutFactory.com and will be made available in stores and other fine retailers. Before he becomes the famed horror writer H. P. Lovecraft, young Howard Lovecraft is a curious and imaginative boy living with his mother. But after she unwittingly gives Howard the legendary Necronomicon, he is transported to a dangerous and frozen world populated by horrifying creatures. After saving and befriending one such creature – Spot – Howard and his new friend set off on a perilous quest to save the kingdom and get Howard home. But Howard soon finds out that not everything is as it seems and not everyone is to be trusted. Voice cast: Jane Curtin, Ron Perlman, Christopher Plummer, Kiefer O’Reilly, Doug Bradley, Scott McNeill, Alision Wandzura, Tyler Nichol. ARCANA STUDIO presents a film by Sean Patrick O’Reilly. HOWARD LOVECRAFT AND THE FROZEN KINGDOM, based on the bestselling graphic novel by Bruce Brown, is written, directed and produced by Sean Patrick O’Reilly; producer, Michelle O'Reilly; art director & senior modeler, Gary Yuen; senior editor, Brendan Hansell; CG supervisor, Haqui Gbadamosi. 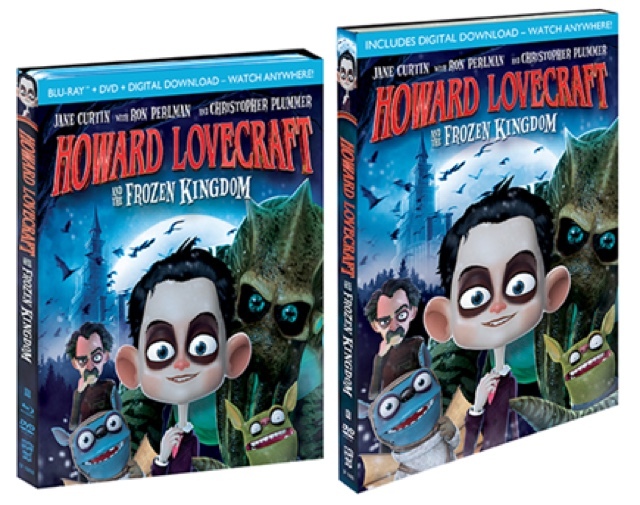 HOWARD LOVECRAFT AND THE FROZEN KINGDOM debuts on two-disc Blu-ray™+ DVD combo pack, DVD, Digital HD and VOD on September 27, 2016. Movie running time: 80 minutes. For more information about the movie, please visit HowardLovecraftMovie.com .